Rain fell everyday this week in Southwest Virginia. All the creeks we fished were running high and off-colored. Some were unfishable. 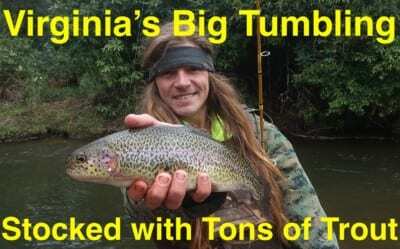 Fortunately, while much higher than normal Big Tumbling Creek is still fishable and loaded with trout as plants continue to arrive four days a week. We filmed two episodes of Pautzke Outdoors on Big Tumbling Wednesday: the first in one hole at the base of the stocking section (the Social Security Hole for you locals) and the next in the rest of Section A and some in Section B. Most of the anglers huddled at Social Security. However, we could only stomach the crowd so long and opted to attempt to tackle the high water and pluck trout out of holes upstream. Water levels are slowly falling at Tumbling, but have a long way to go for most anglers to feel comfortable fishing it. This weekend will still yield excellent catch rates for anglers who can overcome creek flows. The creek was stocked today and will be stocked again tomorrow by the Virginia Department of Game & Inland Fisheries. Most of the trout being stocked are rainbows right now and they are beauties. We spend 10 months each year traversing the country to catch trout. These stocked fish are the best quality we’ve seen in a decade. Most of them averaged two pounds and while we didn’t catch any this large we did see other anglers catch them up to almost 10 pounds. In addition to the rainbows we caught two brook trout, but didn’t land any browns. Outside of fishing the Social Security Hole success will be defined by how well you can read water. More than 90 percent of the stream is sporting turbulent flows. However, anglers who can find small holes, pockets, undercut banks and slower water behind large boulders will be the most successful. There’s plenty of trout in these areas. While we only used Fire Bait in the Social Security Hole (and caught dozens) we focused on Fire Balls in the rest of the creek. Reason being, this creek is raging. Fire Balls stay on the hook better than real Pautzke eggs. The great thing about the Fire Balls we used is how strong the scent is. 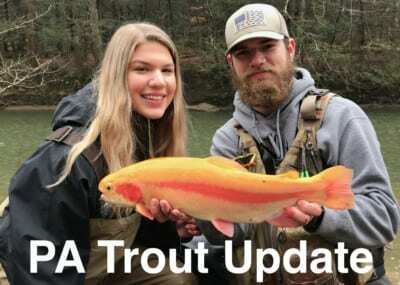 We focused on Pink Shrimp, Chartreuse Garlic and Gold Garlic and even though they were moving fast in the water their scent is so strong the trout picked them off quick. Because the water is flowing so fast it’s ok to use six-pound test. They aren’t line shy. We pierced them on a size 12 Eagle Claw single salmon egg hook and placed two Water Gremlin split-shots on the line. We put two split-shots together roughly four inches above the hook in order to get the bait down quicker in the water column. *Please keep in mind there is a limit here. And, that means one limit, per angler, per day. 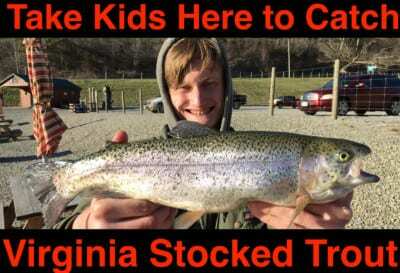 Unfortunately, we encountered two old-timers who caught their limit of six trout, brought them to their car, went to lunch and came back and kept more. They fished the same spot and didn’t even change their clothes. Taking two limits is illegal and ruins the experience for other anglers who want to catch trout, too. 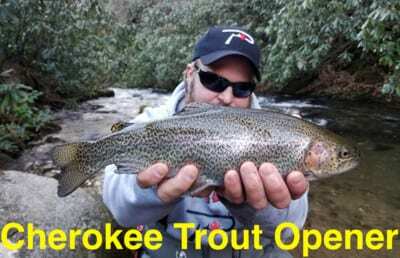 Editor’s Note: A day permit is required to fish Big Tumbling Creek. It’s $8 per day and more than worth it. Pautzke Fire Balls and Fire Bait are available at all Southwest Virginia Walmart locations and at Bass Pro.